Born & brought up in a Delhi based reputed family that was into Entertainment/Movie Exhibition business passing through an ebb, with income being inadequate to provide a comfortable life style to a very large joint family, his father zeroed down to trading of Industrial Recording Papers in 1974 as a side business after trying his hand in a couple of businesses. With no substantial earnings coming out of it in the following years, his mother was also reluctant of him joining his father’s business. But duringhis growing up years, he kept on developing a keen sense of observation and inquisitiveness to learn by taking active interest in various family businesses. Armed with all these learnings, after passing out in 1990 from Delhi University he was confident of turning the business into a successful proposition if he moved into manufacturing and utilize the contacts that his father had built over the period of 16 years. These convictions led to the installation of the first unit with a start-up capital of Rs. 50,000 for the manufacturing of Industrial Recording Papers; this was his first step towards being an Entrepreneur. With the onset of computerized recording, the Industrial Recording Paper demand was stagnating & at the same time Healthcare awareness was increasing in India. Being the same industry sector & seeing the potential, he transitioned to Medical Recording Papers in 1995 & set up the first factory by arranging funds from all possible sources including Bank loans & personal loans from the market. In the beginning it was quite a struggle, but he was determined. What followed for the next five years was a hectic work schedule with a 12 to 16 hour work-day which helped him in establishing the business; emerging as the largest OEM/OBL supplier of Medical Recording Papers in India. With the dawn of 21st century, the Indian economy was looking up and the Healthcare industry was booming. He saw a good potential in starting with manufacturing of Disposable ECG Electrodes, which was a complementary product. The Electrodes available in the market were mostly imported and there for expensive, even the supply was erratic. There were no quality ECG Electrodes manufacturers in the country at that time. 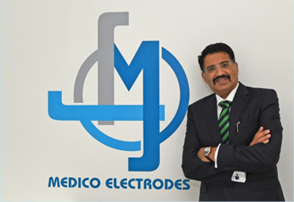 In 2002 he took up the challenge to start the manufacturing of Disposable ECG Electrodes with the machine & technology from USA & offer world class quality products at affordable prices. The next two years were a period of struggle where every day was a new challenge and special efforts were required to overcome even small problems. He learnt fast from experiences and the initial success made him realize the enormous potential of this product worldwide as the same was largely manufactured in USA & Europe. Taking advantage of the low labour cost in India & New SEZ Policy announced in 2005 by Government to promote Exports, he decided to move the manufacturing activities to a much bigger “state-of-the-art” facility at Noida SEZ in the year 2006. This helped him to focus on international market and globally compete with the best in the industry. Hard work, determination and passion for excellence helped him to grow the business and soon was able to develop the capability of manufacturing production machinery in-house. These machines have production rates that far exceed those being used in the US/Europe. The quality of Electrodes manufactured are considered to be in the same league as the ones manufactured in the USA, Europe & Japan. The company is accredited with ISO 13485 and US FDA Registration. From the start in 2002 to achieving half a billion disposable ECG Electrodes sales per year in less than 12 years appears to be a dream come true. With a constant endeavour to grow, in 2015 yet another milestone was achieved when the company bought 100% shares of a UK based manufacturer with two production units, thus providing a multinational base to the company. One of the units producing TAB Electrodes, Electro Surgical Plates and TENS Electrodes; has been moved to India, which will enhance the existing product range & open up new avenues for business both in domestic market as well as exports. 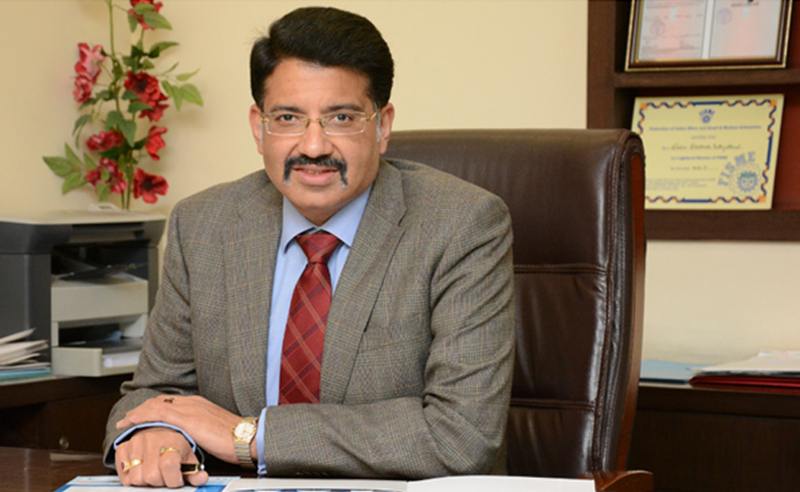 At present, these products, though very popular overseas, are yet not commonly used in the country – this will provide a unique opportunity and a marketing challenge to introduce the new generation products in the Indian market and make quality healthcare available at economical prices to people at large & be the forerunner in these categories as well. The second unit with Hydrogel manufacturing facility using the latest technology and technical expertise, will open up un-imaginable avenues beyond the growth of existing business; as the gel technology today is used not only in the production of Biomedical Electrodes but also finds its usage in several new areas like Wound care, Defibrillation Pads, TENS Electrodes & Drug Delivery applications. Thiswould help in meeting the company’s internal manufacturing requirements and in addition, willenable commercial supply of Gel to other Electrode manufacturers throughout the world. It will thus provide Medico better control over the entire value chain from high quality gel component to low cost manufacturing operations and will help the company in sustained growth as this complete set of technology is available with very few players globally. The Company, in 2016, was awarded the prestigious INDIA SME 100 Award(selected from over 46,000 entries) in recognition of its growth, competitiveness &production excellence. The same year, Mr Amit Mehra was conferred with the award titled ‘India’s Small Giants’, one of the 40 recipients in India, who started out with little or no capital and have gone on to create a legacy with their enduring entrepreneurial spirit & courage of conviction. The journey from small to not only big …. but a Giant in stature. In March 2017, the Company was awarded the Medical Equipment Exports Company of the Year organized by the ASSOCHAM (the Associated Chamber of Commerce & Industry of India), which is the oldest and largest apex chamber serving the nation since 1920. The evaluation criteria was based on several factors including Innovation and Research, Percentage Revenue from Exports, Growth, Quality Management system & Launching of New Products etc. International product quality, Development of new products, Competitive price and Excellent customer service – have been the pillars of strength for establishing the business credentials worldwide, which has taken the company’s turnover to Rs. 160crore. At present, Medico has two manufacturing units in SEZ and one manufacturing plant in the UK. The Company today, commands a major share of the Indian market and has reached the enviable position of perhaps the third largest manufacturer of Disposable Centre Snap Electrodes in the world and the biggest outside the USA. The company, presently exporting its products to 35 countries across the world in addition to India, is moving ahead towards its goal of selling a billion ECG Electrodes annually by the year 2020 and is hopeful of achieving similar success worldwide in the new product range. In short, Medico is a fine example of “Make in India” spirit propagated by our Honourable Prime Minister & we are proud .of it. Copyright © Medico Electrodes International Ltd. All Rights Reserved.